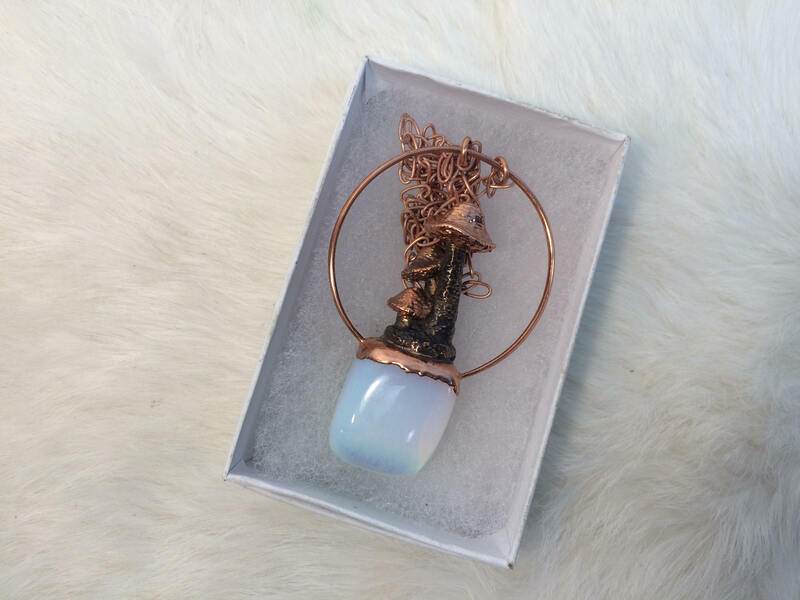 This is a beautiful hand-made electroformed Opalite Pendant. 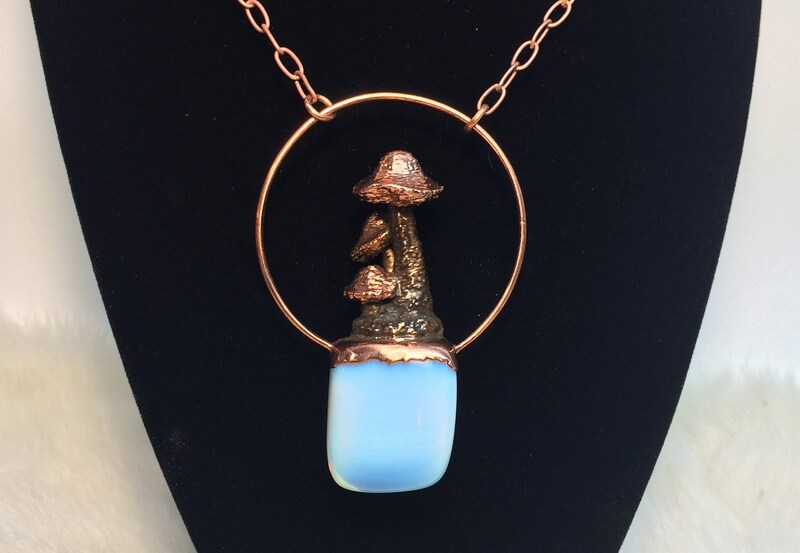 The top of the opalite is adorned with a electroformed mushroom batch. The stems are darkened to offer contrast with the copper features of the mushroom tops. 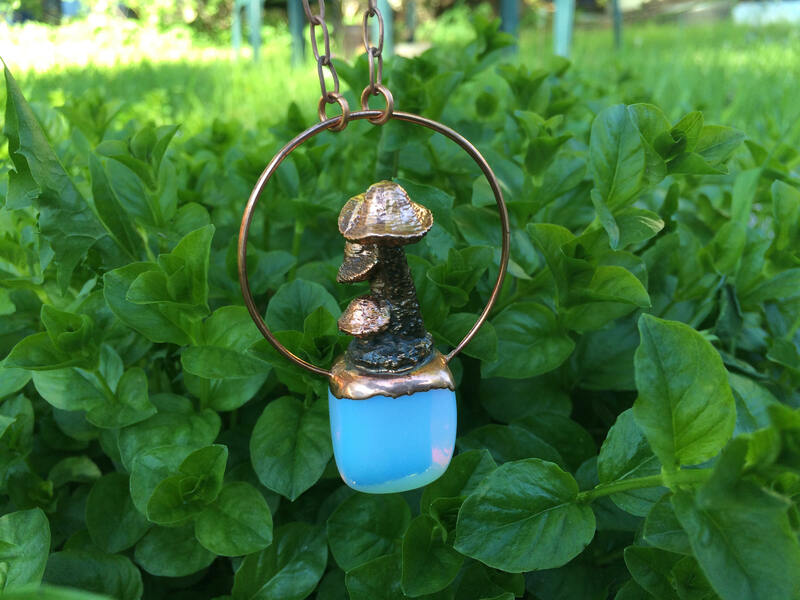 A copper ring hold the pendant in place and is attached with a matching 26" Chain. I am quite pleased with how this piece turned out and hopefully someone will enjoy wearing it as I did making it. The pendant measures 3" x 2" and weights 1.1 oz. 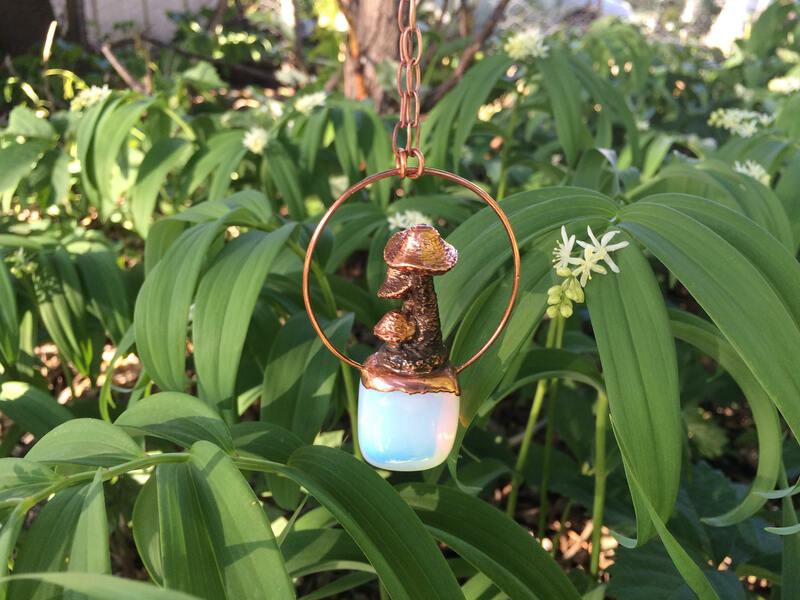 The core opalite with mushrooms measure, 2 1/4" x 1". I electroplated the 26" chain to match the finish of the pendant. 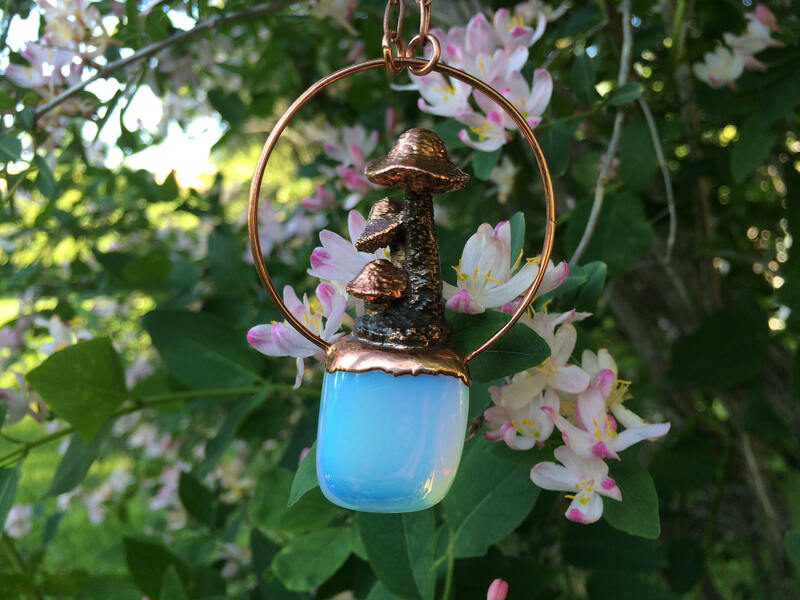 This is a unique one of a kind Opalite piece, that would make an excellent gift or an addition to your collection. ->> Processing time from order placement to shipping can vary depending on the work required for the particular item. 2-Note: Shipping does not come with Tracking #, unless they are ordered. The price for tracking is determined by the postal authority. ->> I will ship to the address on your Etsy account. So PLEASE update your Etsy address to the correct shipping address. Should an item be sent to a wrong address because your Etsy address is not up to date, I will not be held responsible. ->> I am not responsible for any lost or returned parcels due to wrong addresses, items not claimed, or items rejected, issues with your countries customs, etc. If the parcel is returned to me for any of the above reasons, it is the buyers responsibility to pay for shipping costs to re-ship your parcel(s) back to you. I will advise you if your items is returned. ->> I am not responsible if you do not receive your item or if your items was damaged due to shipping or your country's import processes (Customs). ->> I'm not responsible for any delays due to customs . ->> I am NOT responsible for any extra costs, taxes or import fees that may be assessed by your state or country. Any extra fees, re-shipping fees, or return fees will be the sole responsibility of the purchaser. All items are photographed at time of shipping and made available to the buyer upon request. Our products are shipped via Canada Post. Full refund on items available only within 24 hours from time of order. No exceptions. ->> It is important to ask questions before your purchase. Please ask any questions BEFORE buying in the shop, especially if you are unsure, or you have a special request, etc, in order to avoid any misunderstandings! ->> Special Requests and Custom Orders may require extra time then what is suggested at the time of purchase. Shipping and processing times may vary. Please inquire if you have any questions or concerns. ->> All items are hand-crafted and sold AS IS. My hand-crafted items may have subtle differences and may not appear identical to the image shown for the item listing. Should you have questions regarding an item I make, please contact me prior to purchase. ->> I am NOT responsible for any extra fees via your state/country, or re-shipping fees, or return fees. ALL extra fees will fall within the customers priority to cover themselves. ->> If an item is broken AFTER purchase while in the care of the buyer, I am NOT held liable for refunding once the item arrives safely from me, to them. NO refunds are accepted outside of the above statement. ->> Should you feel inclined to use Etsy dispute resolution process, please contact me 72 hours prior to filing a dispute so that we may find a more appropriate resolution. Items are photographed prior to shipping. Item Packaging with destination address, etc are photographed when shipped. All items are custom made, hand-crafted and are sold as is. If you are having issues, questions or concerns, please contact us. YES!!! We can do wholesale orders depending on quantity. Please contact us for more information. Do you seal your items? Seal: A sealed item provides extra protection from wear, tear, and oxidization. Yes and No...usually yes depending on how it was finished and the aesthetic I am going for. I will note how the item was finished in the description. Sealants...I use a super awesome polymer sealer for most items. Carnauba Wax for some items. Electroplate for other. (Metal over Metal). We have a metal allergy in the family so I am mindful of allergies. If you have a particular allergy, I may be able to amend a product. Please send me a note at the time of order and I will see what I can do for you. Do you use plated materials? I will electroplate a material (mostly chains) to match the finish of the electroformed item I created. Some items I will use multiple electroplates with different metals to create a particular aesthetic. At a Minimum I use Brass and/or Copper Chains. I may apply additional electroplating to the chain to match the object it would go with. Depends on what the item is. Most pendants are sealed using a super cool polymer and don't need care other then a wash with soap and water. Items finished with electroplating...a toothbrush to clean, and wax (Carnauba usually) to seal. Best method is to keep them clean and dry. How are the items shipped (Boxes, stuffing, etc)? I would very much like to have branded boxes made from unbleached recycled brown paper and such. However, I am just starting out and keeping things at a minimum for the time being. Most items are placed in a recycled paper gift box and shipped in a bubble envelope.